I have two college age guys that come and go as they please. Between their work and school schedule I never know when they will show up, but when they do they are always hungry. 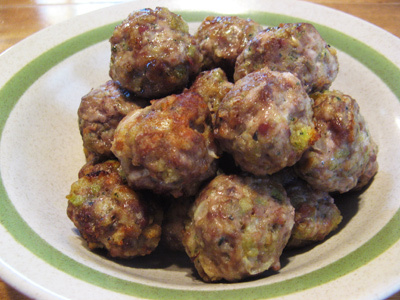 Meatballs make a perfect meal for these hungry guys so I like to make big batches of them to freeze so that we can pull them out for a quick meal. 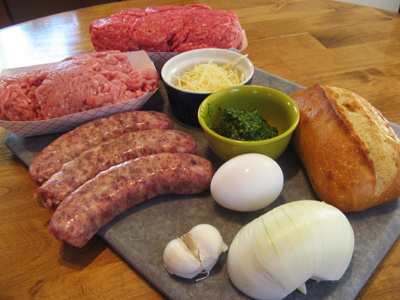 Making your own meatballs are not that hard and are the perfect compliment to your favorite pasta or soup plus they make a mean meatball sub too. It starts with 3 kinds of meat. 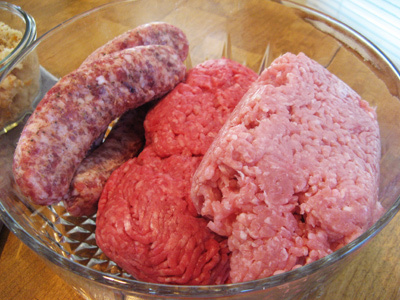 1 pound each of ground beef, ground pork and sweet italian sausage. Grating the onion preserves all the juice to make a moist meatball. I like to use the small Artisan loaves that you get at Costco. They come in a 6 pack and 1 loaf makes just the right amount of bread crumbs to bind everything together. Add a couple cloves of garlic, 1 egg, pesto, and parmesan cheese. Take the artisan loaf and break it into pieces and place it in a food processor. 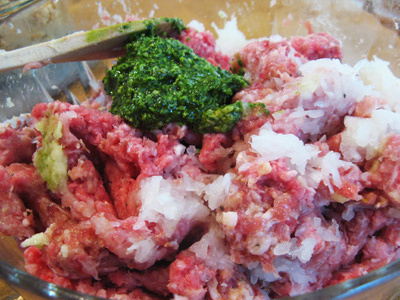 It will process into bread crumbs just like this and will taste so good in the meatballs. 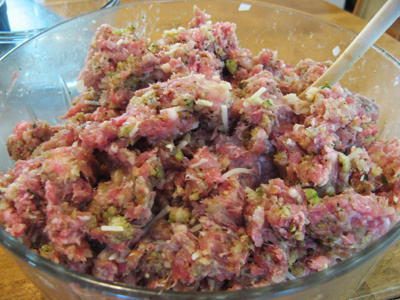 Using a large bowl combine you ground beef, ground pork, and italian sausage. Hand grate the onion and garlic and add to the meat. Mix it all together. I like to get my hand in there and squish it all around. Add 1/4 – 1/3 cup of pesto, however much you like. Pesto contains all the herbs I would use anyway so it felt like the natural thing to add. The aroma at this point is really starting to get to me. Time to add the artisan bread crumbs, parmesan cheese and the egg. Mix that all together with a wooden spoon or your hands. All mixed together and ready to form into meatballs. I find that an ice cream scooper makes the size of meatball that we like and they all come out about the same. This batch made about 60 meatballs. I am going to cook 24 and put the rest into the freezer. I’m freezing them uncooked because I know I’m going to be able to use them soon. But they can also be cooked now and packaged for the freezer. Line a broiler pan with aluminum foil to catch the drippings. That makes for easier clean-up. 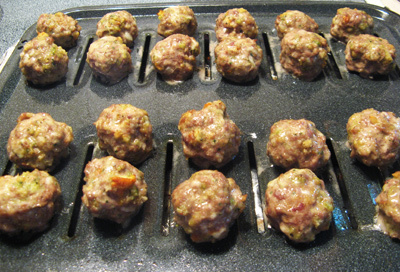 Spray the pan with cooking spray and line up the meatballs. Cook 10 – 12 minutes at 375 degrees. They are starting to brown but they need more time. Turn them over to brown on the other side for another 10 – 12 minutes more. A little crisp and perfectly browned on the outside. Juicy and packed with flavor on the inside. These will go great on a plate of spaghetti. Take the small artisan french bread loaf and tear into pieces. 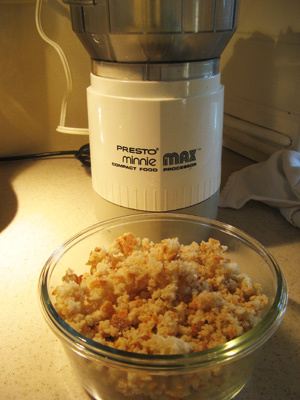 Place in a food processor and pulse until the bread becomes coarse and crumbly. Set aside. Combine ground beef, ground pork, and italian sausage together with a wooden spoon. 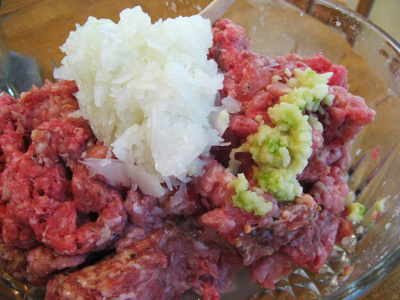 Add the grated onion and garlic to the meat mixture and work in with the meat. 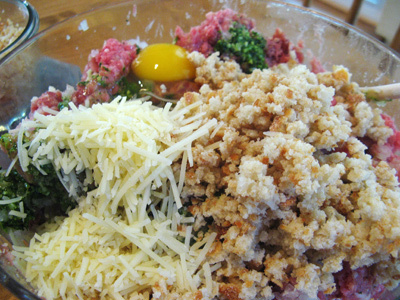 Add the artisan bread crumbs, 1 egg, Parmesan cheese and pesto. Work in well so that all the ingredients are evenly distributed. Preheat oven to 375. Line the bottom of a broiler pan with aluminum foil to catch the drippings. Spray the top pan with cooking spray. 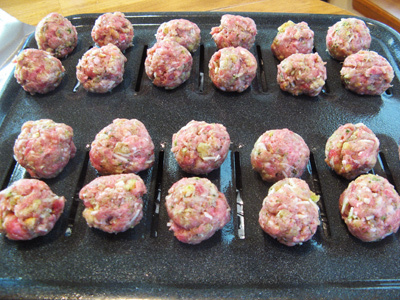 Using an ice cream scooper form meatballs and place on the broiler pan. 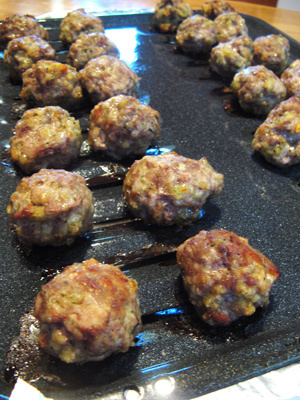 Cook meatballs 10 – 12 minutes until browned on the top side. 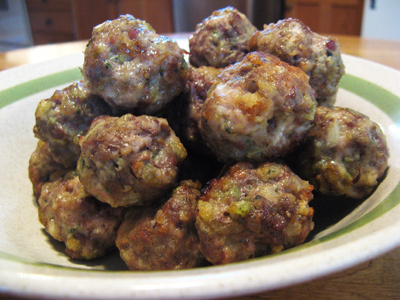 Turn each meatball over and cook an additional 10 – 12 minutes to brown evenly. 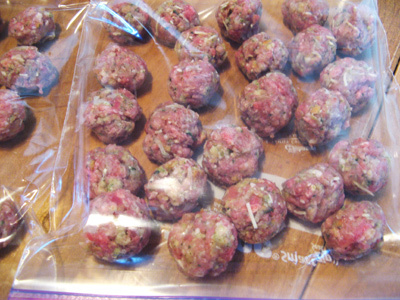 Any unused meatballs may be frozen either uncooked or cooked.